, a Roman catholic writer of considerable fame, and one of the principal champions of popery in the sixteenth century, was born about 1527, at Charlewood in Surrey, and educated at Winchester school, whence he removed to New college, Oxford. Here he studied chiefly canon law, and was made fellow of his college in 1548, and in 1550, or 1551, took the degree of bachelor of laws. When queen Mary came to the throne, he had the offer of being Latin secretary to her majesty, which he declined for the sake of a studious, academical life, and remained at Oxford during the whole of her reign. In 1557 he was one of the professors of canon law, and read what were called the “shaggling lectures,” i. e. lectures not endowed, until the accession of queen Elizabeth, when his principles induced him to quit England. He arrived at Rome about the latter end of 1560, and studying divinity, became doctor in that faculty, and was ordained priest by Dr. Thomas Goldwell, bishop of St. Asaph, who at that time resided in the English hospital at Rome. Soon after, cardinal Hosius, president of the council of Trent, hearing of his abilities, took him into his family, and made use of him, as his theologal, in the council. 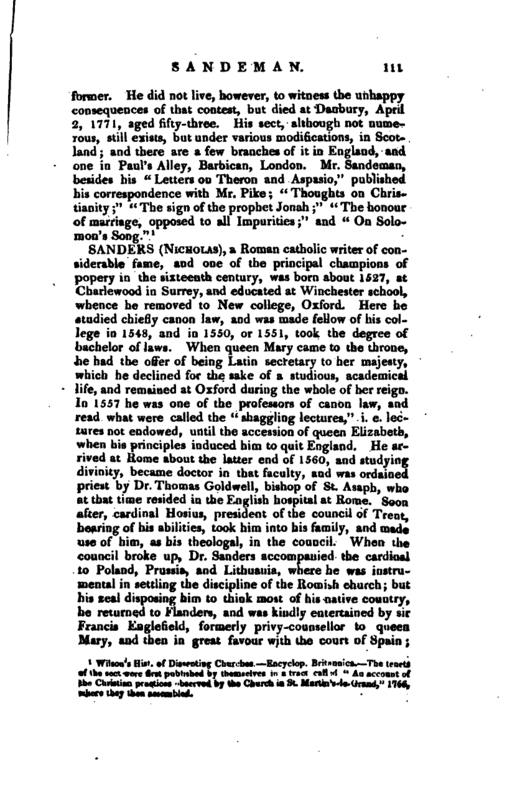 When the council broke up, Dr. Sanders accompanied the cardinal to Poland, Prussia, and Lithuania, where he was instrumental in settling the discipline of the Romish church; but his zeal disposing him to think most of his native country, he returned to Flanders, and was kindly entertained by sir Francis Englefield, formerly privy-counsellor to queen Mary, and then in great favour with the court of Spain; | through whose hands a great part of those charitable collections passed, which his catholic majesty ordered for the subsistence of the English popish exiles. 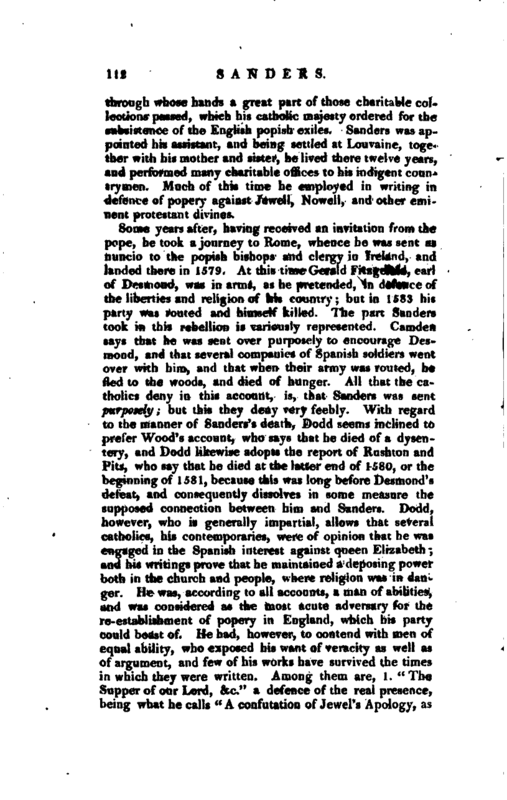 Sanders was appointed his assistant, and being settled at Louvaine, together with his mother and sister, he lived there twelve years, and performed many charitable offices to his indigent countrymen. Much of this time he employed in writing in defence of popery against Jewell, Nowell, and other eminent protestant divines. 1 Ath. Ox. vol. I. Dodd’s Ch. Hist. —Strype’s Parker, p. 377 and 381 Burnet’s Reformation. 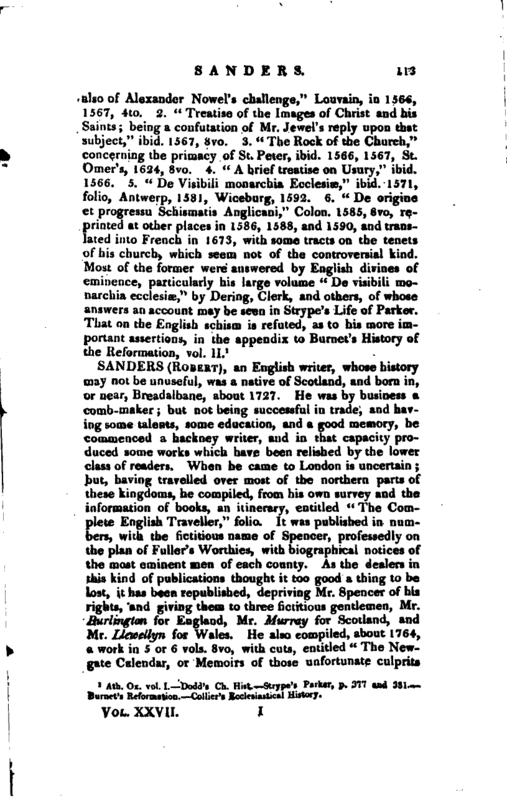 Collier’s Ecclesiastical History.